The official pleaded, "Lord, please come now before my little boy dies." Then Jesus told him, "Go back home. Your son will live!" And the man believed what Jesus said and started home. 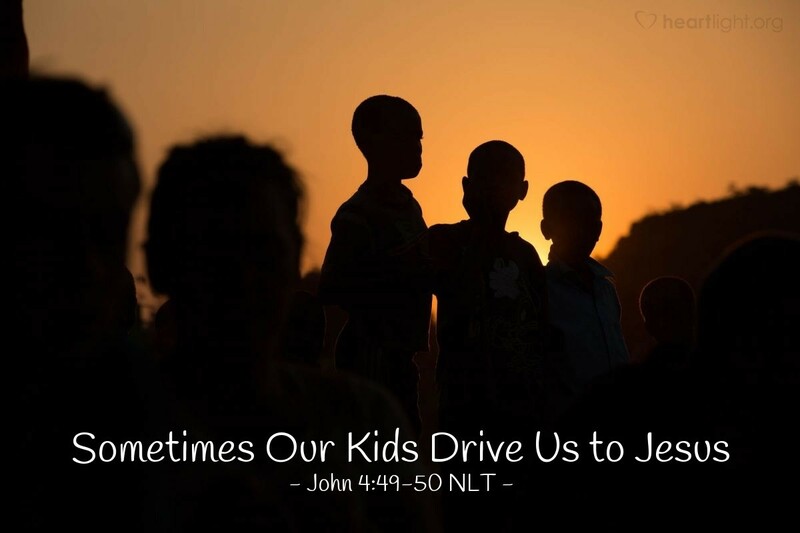 Sometimes the circumstances with our children drive us to Jesus for help. Deep inside our souls, we already know that we should daily seek Jesus with all of our heart. Unfortunately, everyday "busy-ness" and routine distractions choke out our apparent hunger to be in his presence. Then the crisis comes, and we realize again how much we need him. The real question for us is whether we will come to Jesus for help in our time of need. If your concern for children or grandchildren is heavy on your heart, please turn to Jesus for a listening ear, a sensitive heart, and the power to act. If you aren't at the point of crisis, now is the best time to bring your children and grandchildren to the Lord in prayer and through time spent with them with a focus on the Lord. Father, give me the courage to seek you in my crises and to trust Jesus to act in my world to provide the opportunity for change. Give me the discipline and the will to bring my family to you before the crisis. Make my house a house in which your name is praised and your love is shared. In Jesus' name, I pray. Amen.